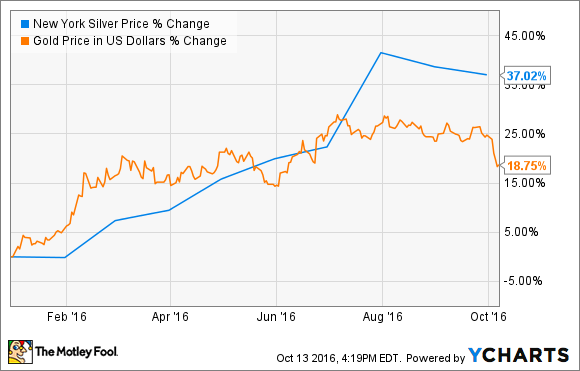 The junior silver miner reported a double-digit decline in precious metal production during the third quarter. Image source: Great Panther Silver Limited via Flickr. Great Panther Silver (NYSEMKT:GPL) was one of several silver mining stocks that reported third-quarter production this week. Unfortunately, its numbers were a bit of a disappointment after consolidated production dropped by 12% to 953,632 silver equivalent ounces. Given where precious metal prices spent most of the quarter, that decline could not have come at a worse time for the company. Great Panther Silver currently owns and operates two silver mining operations in Mexico. That is a tiny portfolio compared to rival miners, such as silver industry giant Silver Wheaton (NYSE:SLW), for example, which currently receives production from 22 operating mines. Because of its small size, minor issues can have a much larger impact on Great Panther Silver's production. That was certainly the case during the third quarter when two temporary shutdowns related to worker deaths affected output. In addition to these closures, lower ore grades also hurt production. As a result, the company's silver production dropped 13% year over year to 510,491 ounces, while gold production declined by 11% to 5,423 ounces. Something similar happened last quarter when silver production fell 17% because the output from the San Ignacio mine had a higher gold-to-silver ratio, resulting in gold production's increasing 13% while silver equivalent production declined by 5%. Because of that, the company could have made more money if it had been able to maintain production, while growth could have caused profits to surge. That is the likely fate of fellow Mexico-focused silver miner First Majestic Silver (NYSE:AG) after it set a new record for silver production during the third quarter, producing a total of 4.5 million ounces of silver equivalent from its six operating mines. First Majestic Silver said that it produced 3.1 million ounces of silver during the quarter, which was not only up 20% year over year but rose 9% from the second quarter, meaning that incremental production came online at the perfect time. Given the simultaneous increases in First Majestic Silver's production and precious metal prices, the company's upcoming third-quarter earnings report should be good. Silver Wheaton is also on pace to deliver strong production and profit growth in the third quarter after it recently boosted its stake in the Salobo mine, which gives it another 25% of the life-of-mine gold production. During the second quarter, increasing gold production from Salobo was one reason why Silver Wheaton's gold production jumped 40% year over year, which helped drive its cash flow up by 23%. Overall, Silver Wheaton's larger scale and diversification proved invaluable during the second quarter when it was able to more than offset significantly lower production at the Penasquito mine, which suffered from lower ore grades, a planned maintenance shutdown, and several start-up issues. Great Panther Silver faced several production challenges in the third quarter, resulting in a double-digit dip in its output. That drop came at a bad time because silver and gold prices were riding high during the quarter, which will likely be reflected in the company's upcoming earnings report. Furthermore, the report highlighted one of the big risks of investing in a smaller mining company, which is that relatively minor operational issues can still have a significant impact on results.